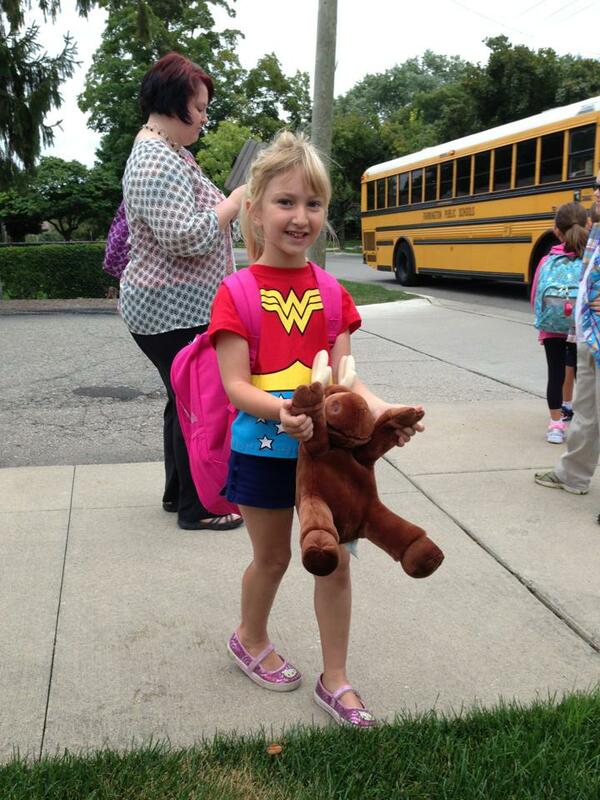 Lily, on her first day of kindergarten. Lily’s generally had a smooth, easy transition into kindergarten, but in the middle of the night, after maybe only her 3rd or 4th day, she awoke from a bad dream; and when she couldn’t go back to sleep right away, she started to tell me about what a mean older girl had said to her as she waited for the bus after school. “She said my teacher was Mrs. Ugly,” Lily said, starting to cry. “And she said I jump like this.” Lily climbed down from her bed and stood, tossing her arms up while her feet just barely left the ground. Though my outgoing girl is brave in many ways – she climbed the steps of a 12-foot inflatable slide by herself shortly after turning 2 – she’s about as thick-skinned as a paper doll (as are nearly all boys and girls her age, of course). And as we all acknowledge, with a slow-boiling dread, the big, bad world is not for the faint of heart, and sending your little one out into that world for the first time is a profound, if inevitable, act of trust. Which is to say, you best not mess with my little girl, world. But more on that later.